Denver was on fire the entire meet, never staggering from its first-place position in the standings. The real fight in this meet was for second place, and for most of the meet, Florida, Oregon State, and Boise State all had a chance, crunching every tenth to qualify on to nationals. In the end, Oregon State took the second-place spot over third-place Florida by just two tenths, solidifying Denver and Oregon State to move on to nationals. The final team scores were 197.375 for Denver, 196.900 for Oregon State, 196.700 for Florida, and 196.075 for Boise State. Denver and Oregon State will compete against Georgia and Oklahoma in semifinal No. 2 of nationals on April 19. Florida has not missed a national championship since 2000, making this the first in 19 years it did not qualify. In fact, Florida has only missed one national championship since the meet began, making 2019 its second ever year sitting out of the national competition. Going into the meet, statistically Florida was expected to come out on top, both from its overall season and having the highest score into the regional semifinals, a 197.500. The Gators also went into regionals with the biggest season high of these four teams, a 198.025, significantly leading over Denver’s season high of a 197.775 as well as Boise State and Oregon State’s scores of a 197.125 and 197.450, respectively. 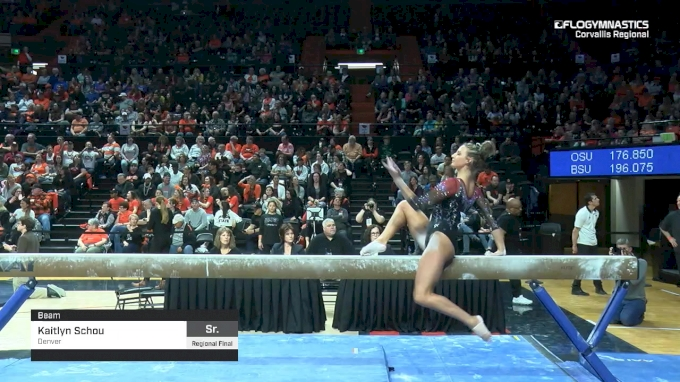 Florida began on beam and shocked the crowd when the second gymnast up, Megan Skaggs, fell and scored a 9.175. Third up was Alicia Boren, and despite getting the highest score of the night on Friday with a 9.950, she fell on her series and received a 9.275. This meant the Gators had to count a fall on the first rotation, and this put them in fourth place with a 48.475. The rest of their beam workers picked up the pace after those falls, but it was not enough to keep them out of last place heading into the second rotation. Boise State was in third going out of rotation one, after a great bars rotation. Bars is generally the Broncos best event, and they did well, especially Alexis Stokes, who put up a 9.850. Oregon State was in second after the first rotation, coming out of a solid vault lineup. The Beavers had huge vaults but not a lot of stuck landings, so they had a lot to prove going into the rest of the meet. Denver started the meet off strong on floor, giving the Pioneers first place heading into the second rotation. After the third rotation Denver had a 49.300, Oregon State had a 49.100, Boise State scored a 49.000, and Florida had a 48.475. Florida had to make up a lot of ground in rotation two, and it had an incredible floor rotation. Trinity Thomas, the only freshman to be ranked top 20 on each event in the nation, scored a 9.975 for Florida with a showstopping routine. 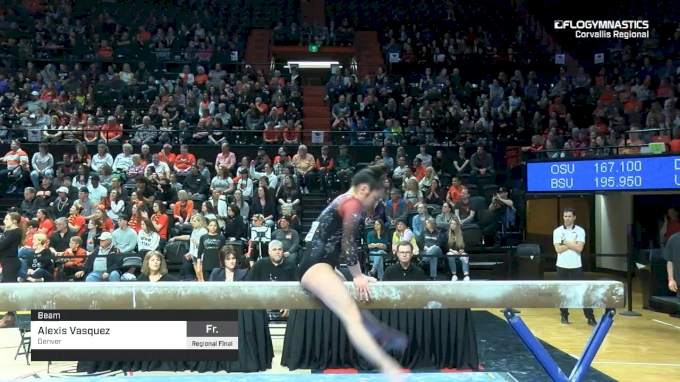 Alicia Boren came back from her fall on beam to give Florida a 9.900. In the second rotation, Boise State had an incredible beam rotation and Oregon State kept its momentum on bars, giving Denver first with a 98.500, Boise State second with a 98.425, Oregon State third with a 98.050, and Florida in fourth with a 97.900. Although Florida was still in last halfway through the meet, it had barely any ground to cover before moving into third, which it did after the third rotation. Florida moved into third after a truly amazing vault rotation. 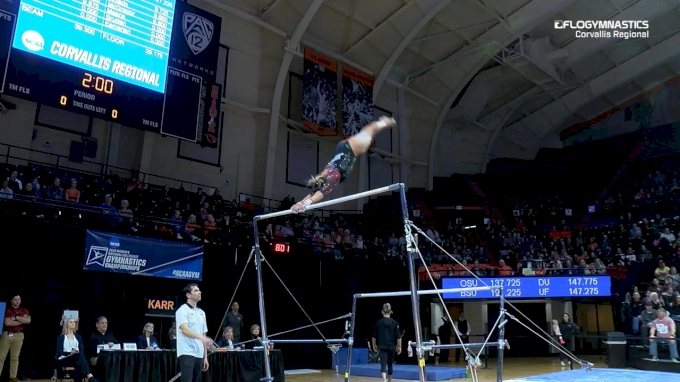 The Gators’ first two vaults were stuck, and they had huge vault scores the whole way through, scoring a 49.375 on that event. Denver had crazy good bars, scoring a 49.450 as a team with a 9.925 from Lynnzee Brown and a 9.950 from Maddie Karr. The final team scores going into the fourth rotation were a 147.950 for Denver, 147.725 for Oregon State, 147.275 for Florida, and a 146.950 for Boise State. At this point, the race for second place was only 0.450 apart, which is not a lot of room for error on Oregon State’s side, especially considering Florida’s bars lineup has consistently scored high this season. Florida had an unbelievable bars rotation, putting up a 9.850 from Alicia Boren, 9.850 from Rachel Gowey, 9.900 from Amelia Hundley, 9.900 from Savannah Schoenherr, 9.875 from Megan Skaggs, and a 9.900 from Trinity Thomas. It truly came down to the last few routines, and every tenth counted. It was easy to tell the Oregon State women knew it as they stepped onto the floor, but they did not let the nerves get to them, as Isis Lowery scored a 9.900 as Oregon State’s second-to-last competitor, and Kaitlyn Yanish scored a 9.900 as the anchor, giving their team the needed tenths to move on to nationals. Denver kept its first-place spot with a stunning beam rotation, earning a 49.425 and showing up just as strong as it did the rest of the meet. Hosting the meet, Oregon State fans were cheering loudly as their team overcame huge odds as the lowest-ranked team in the competition to qualify to nationals. Denver and Oregon State will compete against Georgia and Oklahoma at nationals on April 19. Savannah Schoenherr from Florida took home a 9.900 for the second night in a row, this time taking first place above a four-way tie for second! Join PRO Now to Get Unlimited Access to FloGymnastics! Maddie Karr upped her score from Friday night from a 9.925 to a 9.950, giving Denver the top bars score of the night! Her feet were glued on her double layout dismount, giving the judges a huge smile after her stuck routine, and her handstands were perfectly hit. 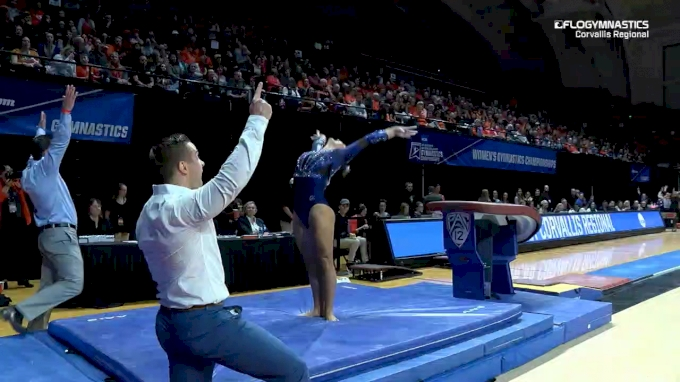 Denver got the top two beam scores of the night. Kaitlyn Schou took first, scoring a huge 9.950. Teammate Alexis Vasquez was not far behind, taking second with a 9.925. Trinity Thomas had the standout floor routine of the night. We think it was a 10.000, but judges gave her a 9.975. Still, her score from Saturday night is the highest ever floor score for a Florida gymnast in a regional competition. This was also her fifth 9.975 of the 2018-2019 season! Behind her, five gymnasts had a 9.900, including Maddie Karr, Lynnzee Brown, Alicia Boren, Isis Lowery, and Kaitlyn Yanish.